Thekkady - A true abode of the wild The name Thekkady is synonymous with wildlife and forests. It is the central point of the tourism zone of the Periyar Tiger Reserve which is one of the best managed tiger reserves in India. 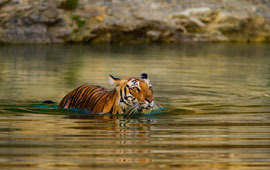 This is the only tiger reserve where one can watch animals at close quarters from a boat. The normal sightings are elephant, bison, sambar deer, barking deer, wild boar, birds of various kinds. If you are lucky enough, you may see tiger, leopard and bear, wild dog etc. while on trekking. If you have an element of love for wildlife and adventure, welcome to this wildlife haven. Thekkady can offer you all these, and more. The rich flora and fauna is a treat for your senses. This is an ideal location for wildlife tourism and eco-tourism. The inviting lush greenery and the tranquil waters of the Periyar Lake would be a relaxing affair.